Running Time: 1 hour and 45 minutes, no interval. Bars: It is a temporary bar and can be located almost anywhere. You can take your drink back to your seat with you. Limited Mobility: 22 steps up to the entrance with handrails on both sides. More suitable alternative entrance available from the car park at the rear of the building. 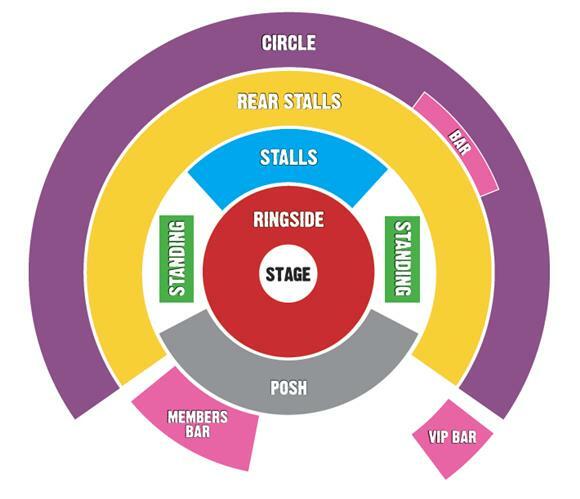 All areas accessible (except The merchandise centre, down steps near the main entrance). Floor bumpy and uneven. Some events have no seating, if you phone in advance they will arrange seating for you. Access Description: Good access for wheelchair users, but very uneven floors. No services or facilities for sensory impaired people. Staff have recieved training. Sound Amplification: Infra-red hearing system in the main auditorium. Induction loop in the box office. Disabled Toilets: The adapted toilet is a portaloo in the car park, near the alternative entrance.